As every Card issuer is devaluing the cards these days, SBI also wants to join the train and they now devalued one of their major card – SBI Signature Card that i was using for quite a time. They’ve also devalued Air India SBI Signature card earlier this year before coming up with this one. I’m happy that i’ve utilized it on time to receive Rs.18,000 cashback recently by accumulating the milestone reward points. I’ve seen one thing to be common in the credit card industry – if anything sounds too good to be true, it wont last long. While i know that new card sourcing has been stopped recently, now SBI has sent me an official mail that my Signature card will be converted to SBI Card ELITE card from Sep 15th on-wards with major changes. Note: Both Visa Signature & Mastercard variant is now available on Elite card. I would prefer the Mastercard version as it has more affiliated lounges. While you can receive similar reward points even on this card like the older version, SBI wants you to spend as high as 8Lakhs which is not that easy for most common credit card users. You get 2% value back on spending 8L but as most people spend around 2-3 Lakhs a year on the card, this saves good amount of money to SBI as the eff. reward rate is around 1% or less in that case. Though the Bookmyshow offer on this card is my favorite, i might close this card by year end as I’ve received this card on FD based. Will you be closing this card or planning to hold? Share your views below. I was planning to apply for Signature card however SBI exe. said its replaced with Elite. Now I have only option as Elite. Can you help me with credit card which gives maximum cashback around 3 % or more? 3% as cashback not available, though Infinia/Diners black gives 3.3% as points. Meanwhile, Amex gives 3% cashback on fuel expenses which is a temporary promotion. is there any credit card in India better than diners black in terms of cashback ? The major difference is Acceptance. What’s the recommendation if I plan to upgrade my SimplySave card. I was getting an option to upgrade to signature but seems like it is not a good option now. Should I stick to SimplySave or should I look at platinum? I’m OK with the fees considering I am planning to use the voucher given. Elite card is still good compared to SimplySave and features like Bookmyshow offer every month is good indeed. 1. The voucher is only provided for the first year or on every renewal? 2. My spends would approx. be around 1 to 1.5 lakes in the upcoming year. Do you think I should look at this card or should I continue with the SimplySave card. I’ll still be okay paying the fees if the yatra voucher is provided every year. On another note, do banks also degrade cards on request, that way I can use this for a year and if no voucher next year, I can switch back to the SimplySave card. 1. Am unsure about this. 2. Its your personal decision. Though its not worth taking this card for this spend level. Yes, they can downgrade if you don’t need higher card. Unsure if all bank does though. I really like how the card looks and that it’s contact-less enabled. But I’m yet to come across a single POS which is contact-less enabled. What a feeling that would be! The only place I have have used contact less is at Singapore ???. I think many banks issue contact less there the operators seems to have a good knowledge of this. I recently acquired the Signature Contactless card and during my visit to Dunkin’ Donuts I got to use this feature. Was quite cool actually. Just wave the card over the machine and done. I dint even know they had the machine for it there, but the cashier saw the card and right away waved for payment. Apply for some other and then close it on 12th month if you dont really need it. however, its still a nice card to hold with 2% value back as Cashback + BMS offers are worth it. Curious to know why suddenly both HDFC and SBI have diluted the value of their premium cards? Are they going to launch new premium cards that’s why such devaluation taking place? Because unless they devaluate their existing high rewards cards no one will actually show inclination towards the new launches? What do you think could be the strategy behind? Its common for premium cards to get devalued when more ppl get access to it. They can’t bear to provide lots of rewards to lots ppl for long time. So they voluntarily issued Regalia easily in last few months and devalued it. Its business. Yes, i do suspect some card is about to be released that betters regalia, coz its been a while since they launched a whole new card. Demonitisation has increased card usage so it’s in the banks interest to devalue the offers on any card. I think there is no further more benefits we are getting on this card so in my view I will close this card in one year tenure. Please suggest which is the best available option as compared to signature card or elite card. Elite card is still good. There are lots of cards. Depends on what benefit you’re looking for. I have an SBI signature card, been using it since 2 months now. I have not received any such letter or intimation from SBI that you have. Are you sure they have closed the card permanently? because they stil have it on their website. They’re informing the customers in batches it seems. But its 100% confirmed that the variant no longer exists. Sid, Thanks for the review. I would go for Yes First Preferred now that you have given a thumbs up. I also came across IDBI Euphoria Master Card World which comes at an annual fee of just Rs. 1500 and it gets compensated on payment of annual fee by way of points. Pros: Add on card holder has the same rights as the primary card holder and this could help those who want to have lounge access for their spouse/grown up kids. Low annual fee and compensation by way of points. Cons: not great offers and no priority pass access. would be good to get your views. You can instead go for Regalia, or even some MasterCard debit card with lounge access. Another quick tip for your blog: the newest comments should be on the top 🙂 makes it easier to read the latest comments! P.S – I bought the signature card based on your SBI signature card review and comparisons! Sure rahul, will keep a note of it. Too late to ask for the voucher, you can still give a try. To convert the card, try to get in touch with Customer care. I am thinking to go back to simply saver from SBI signature . My annual spend is around 2.5 lacs and this month I am completing one year with signature card. I also planning to apply SC Manhattan. That’s fine. There is no use with Signature card if you don’t spend more. Do I get unlimited and free domestic airport lounge access on the SBI Elite card or is it limited to 2 visits every quarter ? What do I pay if any charges are applicable? For Intl. lounge access, do i get unlimited and free lounge acesss or is it at a discounted rate of 27 USD which i need to pay for every visit? For Intl, $27 per access with priority pass card. If someone is looking for just lounge access at airport, nothing like PNB Rupay debit card, no charges per se except for nominal debit card fee. Kindly correct me Siddharth if wrong. True, many MasterCard debit card from Private banks also has lounge access. I had read your Signature card review. Does this card also come with a personalised card holder? I got it few months back, not sure if they still issue the same. Received my Elite card about a fortnight ago. Came in a normal envelope…no box or personalized card holder unfortunately. Also, it took them a fortnight or more to send out this card but that could be due to the fact that I had applied for SimplyClick and then had to cancel my request when I realized that I was eligible for this one. Also requested for my Priority Pass soon after getting the card which they will send by 14th Nov. so all this has been very time consuming. Have been using Air Lounges frequently, but its not a mandate, as multiple cards + Priority Pass is available. I am unsure about renewing my SBI ELite Cards (due to devaluation & no renewal vouchers-so its perceived value has reduced). My Annual Spends on SBI Elite: 5.5L (have been lucky to received 5L milestone bonus in Aug16, Sept16 the change came in), RBL Fun is Movie Rewards so seems fine with 500Rs Spend, Indian Oil- Planning to discontinue as i have gone for CNG now, HDFC Regalia (Idle). I am looking for better options, i prefer Adjustment in Bills of Rewards against any redemption. I am Ok with paying if i can get 3% value and benefits against annual fees. Not Sure about Yes First, Hows Amex and Other Cards. Amex Plat Travel, HDFC Infinia, Yes First Preferred are some to look at. Wow I cant believe that there is a site for such info and someone doing selfless service. I also have a query. I spend almost 10 lakhs through my credit card – all bill payments, insurance premiums, travel booking, dining, shopping online and offline, train tickets, hospital, medical etc. Which is the best card for me? I have been using Citibank PremierMiles for a number of years but that started when I had a lower annual spend. SBI Elite card id good upto 7 Lakhs, rest you can put on other cards. Hi. Thanks for your sharing. I just started using this card (mine – first) and I was wondering if SBI gives points if I pay insurance premium through this Elite card. Do you have any idea? Yes, you should get it unless mentioned otherwise. Thanks for the info. Have one doubt, can we redeem the reward points to pay the Annual Fee for SBI Elite card ?? Well, kind of. But not exactly. Reward points can be redeemed for cash credit on statement. What is the validity of the Priority Pass given with this? And any free visits included? No free visits. Should be active as long as the main card is active. You mentioned “You get 2% value back on spending 8L” I just wanted to know if I was missing something because 15000RP (On spend of 5L) + 15000RP (On spend of 8L) + 16000RP (at normal rate of 2/100) = 46000RP on a total of 8L which is Rs. 11500.00 (Each RP = 0.25). Hence, 11500/8000 = 1.41%. Please clarify, thanks. 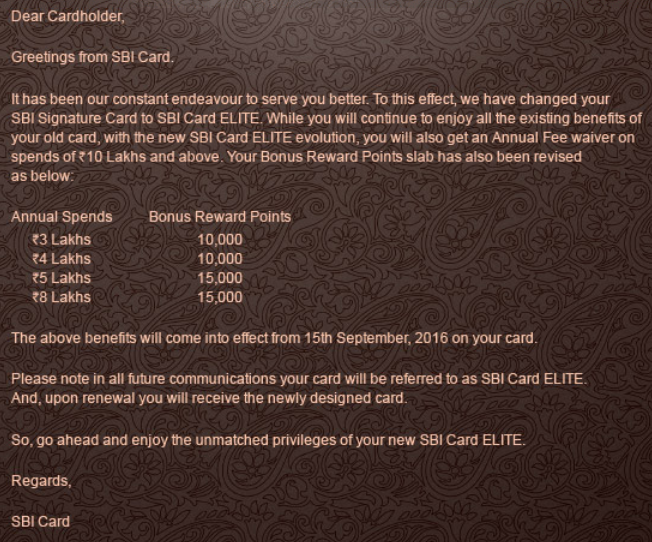 Also, I would like to if you are aware of any difference between SBI Card ELITE Advantage & SBI Card ELITE. I can spend about 1.25CR annually (Company Elec Bill of 8-9L a month) by credit cards but I belong to a small town in Rajasthan where many cards are not available to me yet like Amex, Yes Bank Etc. I have a collective limit of 13.60L on the three cards that I have at the moment but can operate at maximum capacity only if I have a limit of 36L. One of the card that I hold is Regalia which I have been pushing for Infinia with HDFC. Kindly advise what is best for me. Also, in your case, you may not get 16k points earned normally as its utility payment. I’m unsure though. 2. Infinia is good for this spend range. You can also check out Citi prestige or Indusind Iconia Amex card. i want to get the maximum benefit out of this card. how can i do it. secondly i had recd 10000 bonus points as per their old slab of Rs 2 lacs just before new slab came.if i spend 1 lac more will i get 10000 bonus points more as per their new slab? Not sure about both Jitendra. Got to check with the customer care. It is really a breach of contract between the customer who have paid fee in advance for a year. How can you change the bonus limits in between? I am filing a case against them . Pl join me make them understand the importance of consumer right. 1. How does Add-on card work in terms of reward points ? Do the reward points get added to those of primary card ? 2. Can i get cash credit against the reward points at Rs 0.25/point in my credit statement ? I don’t see any such redemption option. 2. You need to call customer care and they will do with Rs 99 + ST charges per such transaction. I have experienced both scenarios. The renewal benefits are worst they will not provide any benefits and vouchers for renewal. 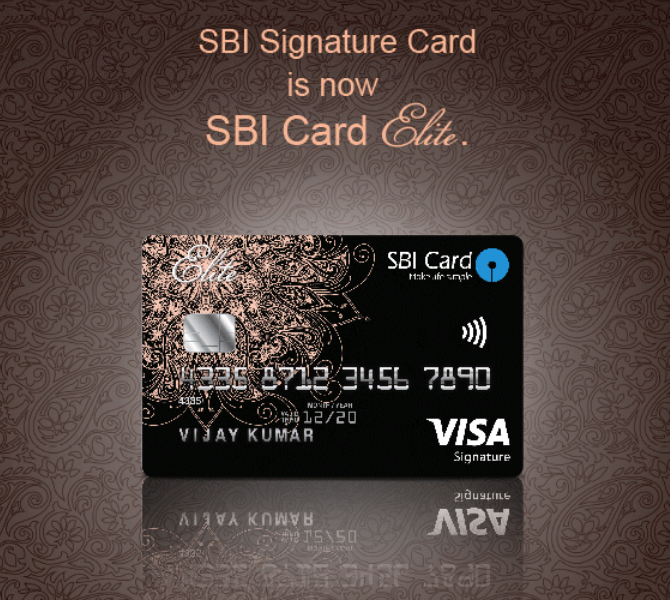 Mine SBI Signature card now Elite card is due for renewal. My annual spend through the year was just above 3 Lakh. Do you think it is worth do pay Rs 4999 + ST as annual fee ? I do have AMEX Gold as other card which also i use regularly. I know there is BMS offer with SBI Elite card but is it really worth it only for thar reason. Do any other card provide similar BMS like offer, just in case i decide to surrender this card and then apply for new one. Please advice. It depends. If you use the full value of the movie voucher every month, yes, you can hold it. Else you need to close it as its best if you spend about 8L a year to get 2% value back. Siddharth your blog has been very very useful. Here’s my take on SBI Elite card. I have been using the SBI signature care (Now Elite) exactly for a year now. The customer care has been good and is only second to AMEX (can’t actually compare AMEX to any other customer service). Unfortunately I have not used HDFC credit cards yet and won’t be able to compare this to HDFC. Return wise I did get a 5000 Rs Shopper Rs voucher as joining bonus but cannot count it since I had paid a joining fees of 5000 Rs. I did transact 5 Lacs and stopped it for a while. I did receive milestone bonus of 35000 Points (10K on 3 L, 10K on 4 L and 15 K on 5 L) Also I did get about 15500 points as regular reward on 5 L spend. so that’s a total of 50500 points. I called the customer care to close the card and the retention team has assured that they will consider waiving of the renewal fees. Will update if it gets through. I did not get the waiver in the Renewal Fees. However the retention team offered me bonus 20000 Points to cover the fees and also told me that they will directly add it as cash back. However I will need to pay the taxes which comes to around 750 Rs. I gracefully accepted it. I just got the signature card. I would like to know, if I go for yatra.com 5000Rs voucher then it would be applicable for flight tickets booking? How can I utilize all the facilities of this card as much possible. Please suggest. you can redeem it for flights and its the best way to redeem it as well. I am using Sbi signature card from Oct’2015. today when i called to get my milestone privilege reward points that point of time i got to know, now this card has become elite card and benefits of elite are valid features can avail. and my spends of 2lacs has now gone in vein and i will not be rewarded by 10000 reward points. Now, i am closing down this card. apart from bookmyshow offer, this card doesn’t have anything great. fee 5000+taxes too high. don’t think got the value of card. 1. HDFC REGALIA – LTF. 2. AMEX JET AIRWAYS PLATINUM – FIRST YR FREE, LIKELY TO BE WAIVED FOR RENEWAL FEE – FOR DOMESTIC LOUNGE ACCESS. 3. YES BANK PREFFERED – LTF. 4. STANCHART PRIORITY (INFINITY ) – LTF. 5. STANCHART SUPER VALUE – FOR CASH BACK ON UTILITY AND MOBILE BILLS. 6. CITIBANK INDIAN OIL – FOR FUEL DISCOUNT. 7. SBI AIR INDIA SIGNATURE. NOW I WANT TO CONVERT THIS SBI AIR INDIA CARD TO SBI ELITE AS IN MY NEW ASSIGNMENT I WONT BE TRAVELLING ON AIR INDIA ANY MORE. SBI ELITE WILL HAVE BMS VOUCHERS AND 6 FOREIGN LOUNGE VISITS IN ADDITION TO MY HDFC 6 FOREIGN LOUNGE VISITS. WHAT DO U SAY? IS THIS OK? AND I WISH TO KEEP THIS CARD ONLY FOR ONE YEAR AS 5K JOINING FEE IS SOMEWHAT REIMBURSED WITH 5K SHOPPING VOUCHERS. Now, SBI wants to sell me their SBI Elite card and have been trying to ‘educate’ me on how I’m being taken for a ride by HDFC Regalia by not offering me anything on it. My yearly spends are above 10L p.a. and it involves frequent international travel payments. Which in your opinion should I be looking into as my replacement of CCs? Appreciate it mate. If you are a frequent international traveller, you’ll need a card that guarantees lounge visits and offers you lowest foreign currency mark up. If your limit is high enough (read above 8 Lakh) then try getting Yes First Exclusive Card. The second way is to get your Regalia changed into Diners Black. That is also very good for value. But be aware that Diners acceptability is an issue in a foreign country. So you’ll better have to keep a back up card. Remember these both cards might be payable. You can get Yes First Preferred too for free if you apply on Card on Card basis and then later you can upgrade to Yes First Exclusive. One more card that is good for frequent flying is Citi PM. Read through the best cards post to understand more.